One of my favorite childhood memories was playing “dress up” with the full-circle petticoat that my mother used to pouf the skirt of her ballerina-style wedding dress. It was a wonderful fantasy of crunchy net, organza, lace, and tulle, and it fell all the way to my ankles—except when I’d twirl around in it, which would make it stand straight out! This pattern is a nod to those fun moments and a tribute to my mother, who I suspect kept the increasingly shabby petticoat far beyond its natural lifespan for my sake. I hope you enjoy creating your own interpretation, and perhaps giving another little girl the same sense of fun and fantasy play that I had. The Option 1 Skirt Overalls feature a full circle skirt, lined bib, straps,a waistband that attaches with snaps in the back, and an optional front pocket. The Option 2 Bonus Skirt is an authentic miniaturized version of a circle skirt and features a waistband that closes with a snap in the back. 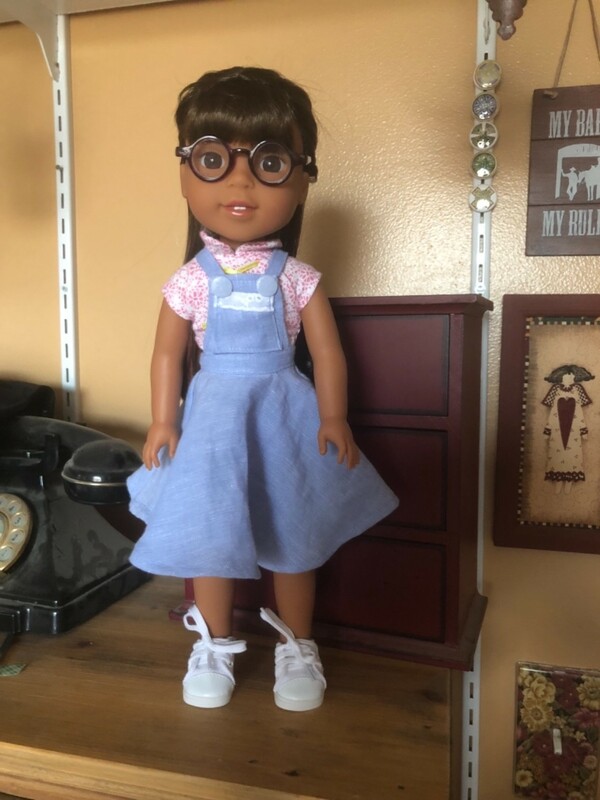 This PDF sewing pattern is designed to fit 14-14.5 inch dolls such as Hearts For Hearts Girls® and WellieWishers™. Recommended Fabrics: Light to medium-weight woven fabric with a bit of drape (quilter’s cotton fabric is ideal for this application). Natural fibers usually hang more attractively than synthetic ones. Examples are light-weight denim, chambray, poplin, or corduroy. Very stiff or coarsely woven fabrics aren’t appropriate for this skirt. PixieFaire and the designers featured are not affiliated with Hearts For Hearts Girls® or WellieWishers™. I like the pattern overall. However! I don’t like to see a bunch of serged edges - I prefer a more finished look. So! I added length so I could tuck my seams under and hide the seams. I have been teaching my 10-year old neighbor to sew, and we successfully used this pattern. I cut the waistband a little longer so there was more room for the closure (my neighbor wanted to used a a#16 Snapsource pearl snap). The next day we made the overall skirt. My only complaint is that we found it impossible to get the overall skirt on and off because the was no wiggle room with the shoulder straps. Ultimately we did not sew the straps down at the back waist, but attached them with tiny straps. My neighbor was happy with the final product and the best part--the doll never complained! I loved using this pattern - it came out soooo cute. I used it for the Wellie Wishers doll and plan to use this pattern in as many ways as I can.